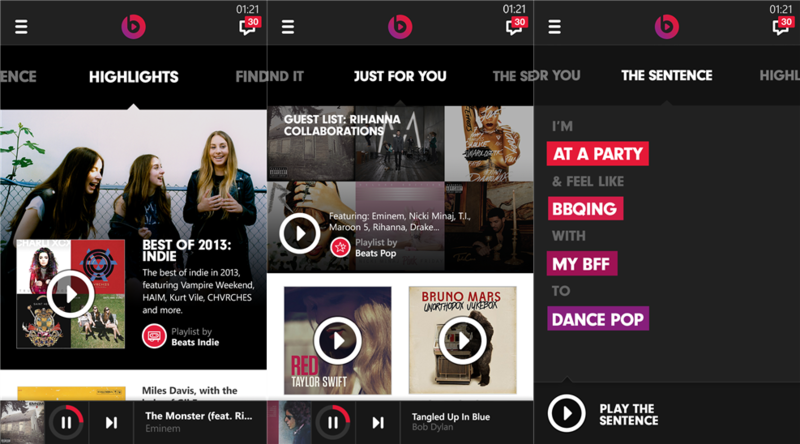 Beats Music was supposed to arrive for Windows Phone last Friday, but there were some delays. Now, almost a week later, you can download the app directly from the Windows Phone Store. The new on-demand music service launched for Android, iOS, and the Web on January 21 (last Tuesday), but both mobile apps didn’t end up showing up until a few days later. Beats Music is priced at $9.99 per month, although AT&T customers can sign up for a $14.99 per month family plan, which gives full access for up to five users. Now Windows Phone owners can join in the fun, too. Just for you: Your first stop for music that’s right for you. A mix of albums and playlists that have been handpicked by our music experts are always ready and waiting just for you. The sentence: Make your mix. Change the sentence up to match how you’re feeling or what you’re doing and who you’re with. Highlights: Discover what’s happening in the world of music. Quick access to what’s worth checking out, even if it’s not on your radar. Find it: When you’re not quite sure what to listen to, reach for the perfect playlist here. Choose a genre, activity, or curator and we’ll do the rest. Share: Get a following by sharing your favorite tracks, albums and playlists with your friends on Beats Music, Facebook and Twitter. Instead of just offering music and leaving users to discover their own tracks, Beats Music attempts to stand out from its competition by helping users discover artists and albums. The app onboards users by asking what genres they’re interested in and then recommends music tailored to those tastes.